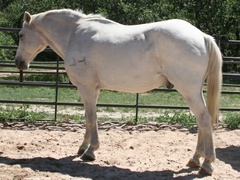 Cody is a 28 year old Percheron / Thoroughbred cross, a very distinguished older gentleman. He joined the herd this summer and for now is the only male in the pasture with Sophie, Mia and Mirage, three much younger ladies. He did have a rough start at life, as a youngster at a dude ranch he was not treated too kindly and still bears some of the emotional and physical scars from his time there. Rumor has it that as a yearling he was attacked by a mountain lion, poor guy had a tough go of it early on. 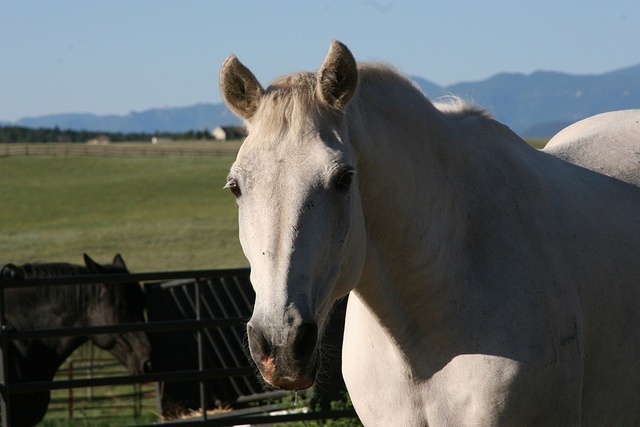 His previous owners helped him through a lot of his issues and he enjoyed his time with them, seeing a good part of the United States faithfully carrying his rider and occasionally joining them on elk hunts. We have found Cody to be quite a pleasure, always a gentleman even though it may take him a little while to warm up to you. A cookie or two usually does the trick. It is a pleasure to be with him and although he may shy a bit at first, we believe he really enjoys all the attention he receives here.